Yano’s photo of Zuiyo Maru ‘plesiosaur’ carcass. 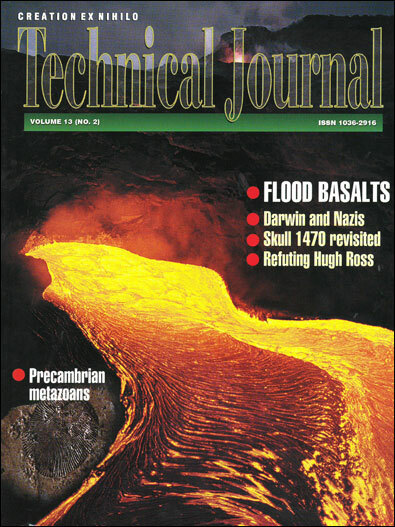 The photograph in Figure 1 in the original CEN Tech. Journal version of this article is a tail view of the decomposing shark. The carcass has lost all fins, including the tail fin — what appears to be a pectoral fin is actually protruding inner organs. 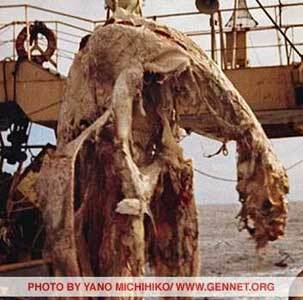 The carcass appears to be at a later stage of decomposition than the Zuiyo-maru carcass. One characteristic of basking sharks is the sloughed skin, giving the appearance of a mane. The ‘mane’ is clearly visible in Bev’s picture. 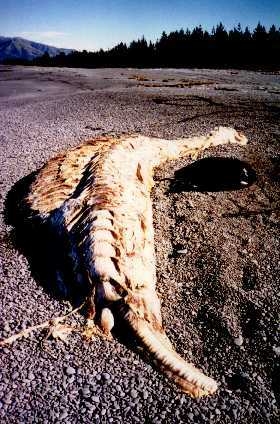 The front view of the same carcass, seen in Figure 2 (below right), was photographed by Bev Elliott 6 weeks later (26 January 1999) — it had shrunk considerably from air/sun drying, and was also more weathered. The head and neck are characteristically plesiosaur-like, and together with the long body, give the impression of a ‘sea serpent’. The relative size and shape of the head is remarkably similar to the head of the Zuiyo-maru carcass as it lay on deck (see Figure 3c in the original CEN Tech. Journal version — see also the picture at the top of this article). Front view of rotting basking shark found on Kaikoura Peninsula, NZ. Basking shark carcass found south of Kaikoura, NZ. The shape and number of neck (or cervical) vertebrae line up with the vertebrae in Yano’s diagram (see Figure 4d in the original CEN Tech. Journal version). Approximately ten vertebrae can be clearly counted. These include a few back vertebrae leading inside the rib cage, which have also been exposed as a result of decomposition and weathering. This agrees with Yano’s reported seven neck vertebrae, and is significantly less than even the thirteen neck vertebrae of the short-necked pliosaurs such as Kronosaurus, which had much larger heads than plesiosaurs and whose body proportions were quite different from the carcass found here (see Figures 4a and 4b in the original CEN Tech. Journal version). And is of course much less than the plesiosaurs, which range from 28–71 vertebrae. The carcass vertebrae (Figure 2, above) are clearly short and cylindrical. Some are weathered in the centre to give an ‘hour-glass’ shape. 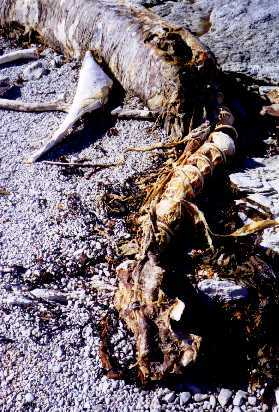 The original shape is clearer in the less decomposed tail vertebrae of the Kaikoura carcass described in the previous article (Figure 5, right, photographed August 1996). The shape of the vertebrae seems to correspond to Michihiko Yano’s description, ‘…the cervical vertebral centra seemed massive and quadrate …’.3 This is quite distinct from the vertebrae of plesiosaurs and other tetrapods which have radiating processes (Figure 4b in the original CEN Tech. Journal version). Also, according to Yano’s description, ‘…each of the vertebrae [measured] 20 cm in diameter.’5 The diameter of the vertebrae was thus half the length of the ribs. This is also approximately the rib-vertebra proportion of the Kaikoura carcass. Some of the evidence and conclusions presented in the original article have recently been challenged. We present here the more important criticisms which have not been addressed in the above discussion of our new evidence, and their answers. After careful examination of several of Yano’s pictures showing this region of the carcass, by several independent people and one author (Jerlström), we find no visual evidence to support the existence of such a fin. This area of the carcass, above the front left pectoral fin, appears to be simply part of the rotting torso (Figure 3a in the original CEN Tech. Journal version). Painting of ‘Yarru’ by North Queensland aboriginal tribe, Australia. 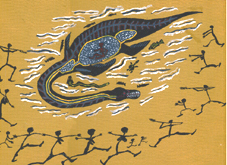 However, from an examination (again made by a number of independent people) of the original painting of ‘Yarru’ by the Kuku Yalanji tribespeople of far North Queensland, Australia (Figure 7, right), it is evident that this ‘upper fin’ is just the matching right pectoral flipper (the rear right flipper is covered by Yarru’s body). It is at the same angle to the body/spine as the left pectoral flipper and it is drawn smaller simply to convey that it lies on the other side of the body. The backbone of Yarru and the bones in the front flippers are drawn in gray (see Figure 7, above). The fact that these are ‘flipper type’ bones, which includes the phalanges at their extremities, further identifies the upper fin as the right pectoral flipper. An upper fin with flipper bone construction (and implied articulation) would indeed be an interesting proposition. The identification by Omura et al.8, of what appears to be a dorsal fin that has slipped to one side and is on its way to detaching from the carcass, may be a common feature of the decomposition process of basking sharks. Dorsal fins may well rot quicker than the pectoral fins; this may also depend on how a carcass lies in the sea. It is interesting to note that there was no mention of a dorsal fin in the description of the ‘Stronsa beast’,9 which was later confirmed to be a rotting shark. But a long neck, pectoral and pelvic fins, as well as a hairy mane were clearly identifiable. With respect to adipocere (waxy substance produced from carcass muscle fat) formation, some have criticized the apparent inconsistency between two of the statements in the original article, i.e. ‘The thick fat tissue and the reddish muscles beneath them …’ against ‘basking sharks are known to have large fat deposits in their white muscles.’10 But like other fish, sharks have red muscle as well as white muscle, the red muscle actually predominating in slow swimming fish like basking sharks.11 So adipocere may be from white muscle deposits close to the red muscles. Some white muscles may also appear red because of residual blood. The second decomposing basking shark found on the New Zealand coast shares many features with the Zuiyo-maru carcass: the size and shape of the head, the size, shape and number of neck vertebrae, and the relative size of the ribs compared to the vertebrae. The criticisms addressed above appear to have ignored the weight of evidence presented in the original article.1 Although it is impossible to make a 100% watertight evaluation of any creature based solely on a few photographs, an interpretative sketch and eye witness reports of the decomposing remains, the evidence collected so far overwhelming favours the basking shark identity for the Zuiyo-maru carcass. Jerlström, P.G., Live plesiosaurs: weighing the evidence , CEN Tech. J. 12(3):339–346, 1998. Return to text. Jerlström, Ref. 1, p. 345. Return to text. Obata, I. and Tomoda, Y., Comparison of the unidentified animal with fossil animals, In: Collected papers on the carcass of an unidentified animal trawled off New Zealand by the Zuiyo-maru, (CPC), T. Sasaki, (ed. ), La Société Franco-Japonaise d’Océanographie, Tokyo, p. 49, 1978. Return to text. Hasegawa, Y. and Uyeno, T., On the nature of the carcass of a large vertebrate found off of New Zealand, In: CPC, p.63, 1978. Return to text. Obata and Tomoda, Ref. 3, p. 48. Return to text. Omura, H., Mochizuki, K. and Kamiya, T., Identification of the carcass trawled by the Zuiyo-maru from a comparative viewpoint, In: CPC, p.57, 1978. Return to text. Goertzen, J., Letter to the editor, July 16, 1999. Return to text. Omura, Ref. 6, p.59. Return to text. Bright, M., There Are Giants in the Sea, Roleson Books, London, pp. 180–181, 1989. Return to text. Jerlström, Ref. 1, p. 344. Return to text. Kuban, G.J., Sea-monster or shark? An analysis of supposed plesiosaur carcass netted in 1977, National Centre for Science Education, Reports 17(3):16–28, 1997; p. 25. Return to text. Kimura, S., Fujii, K., Sato, H., Seta, S. and Kubota, M., The morphology and chemical composition of horny fiber from an unidentified creature captured off the coast of New Zealand, In: CPC, pp. 67–74, 1978. Return to text. Bev Elliott is a Seacare member and patrols a 26-kilometre stretch of beach on the Kaikoura peninsula of New Zealand. She has been a supporter of the creation ministries since 1988. Her interests include bird watching and photography, and, she was, until recently, an ardent supporter of the plesiosaur identification for the Zuiyo-maru carcass. Return to top.